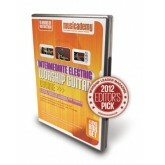 A year’s worth of lessons for today’s electric worship guitarist contained in 10 hours of instruction. Songs used for this course include Holy Is The Lord, Everlasting God (Strength Will Rise), Hosanna, In Christ Alone, Mighty To Save, Blessed Be Your Name, Happy Day, Surrender and Extravagant Worship. 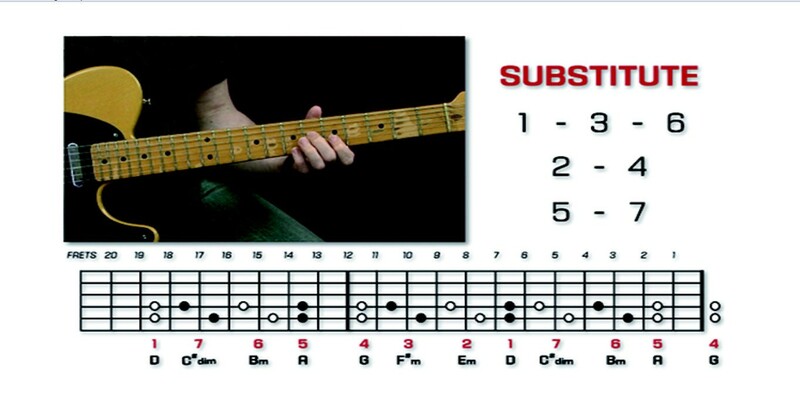 Also perfect for existing electric players with gaps in their knowledge. 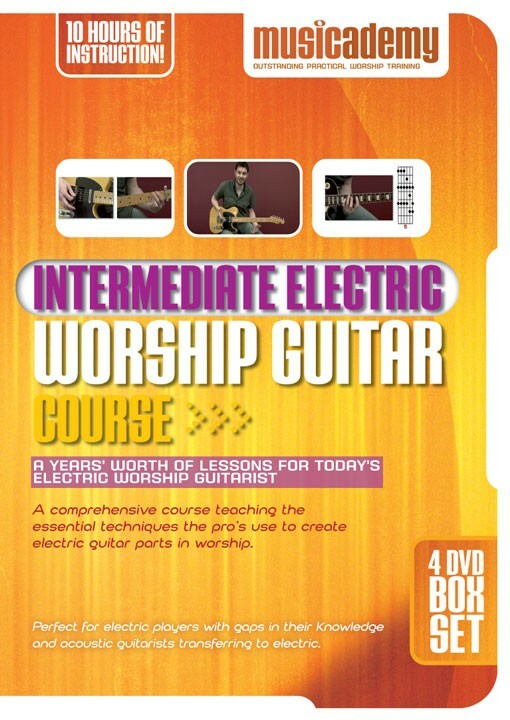 The new Intermediate Electric Worship guitar course is closer to the original Intermediate course and shares a few pieces of technical learning but goes a whole lot further and deeper to give a much more comprehensive electric guitar course. 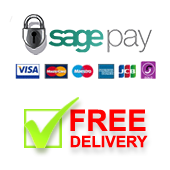 It’s designed to show you the full range of ideas pro players use to craft electric parts in worship. So it does overlap with the basic knowledge of CAGED chords, 5 positions of pentatonic scale and some info on 6ths but from there it’s all new and its all applied into more worship songs with more exercises in many different keys. So there are also 7 positions of major scale, an in depth look at loads of shapes, licks and tricks pro players use in the keys of E A D G and C, over 90 useable electric voiced chord shapes, Hendrix style double stops, 3rds 4ths and 10ths to go alongside the 6ths, Drop D tuning for worship, soloing ideas in major and minor keys plus octaves, volume swells, string bending finger picking, drone notes, power chords, lead lines, tremolo picking, how to find every note on the neck quickly and more! There’s a whole load of tips on amps, pedals, choosing the right guitar, pickups, tones, volumes etc, and even an entire section on leading worship on electric. So it’s also very useful for any acoustic player wanting to transfer across to electric. 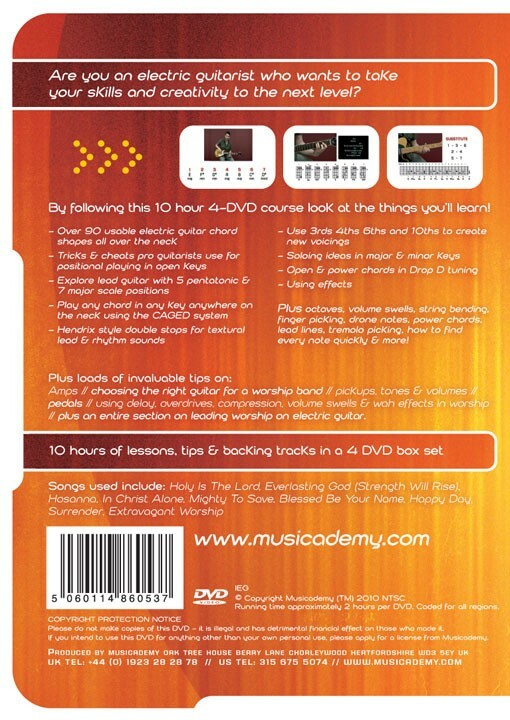 What is the difference between this and Musicademy's other two Intermediate Guitar DVDs? Overall, very helpful. Lots of helpful ideas and explanations. Couple of other thoughts: Topics jump from super easy to super hard within lessons. Some of the assumed knowledge of chords is quite advanced or glossed over. It can be confusing working the "licks" with the CAPO on while referring to the chord shape names that go without the CAPO on. Would be easier on the students to transpose the original so the exercises could be done without the CAPO. I have had some skipping issues with my DVD set. I've been guitar for a few years and have been playing with our church worship team. I'm the only guitarist at our church and have come from a mostly acoustic background so when I picked up the electric it was totally different. I figured out a bunch of stuff on my own, but got this DVD to see if there was anything I've been missing. I've gotten through the first two DVD's and enjoyed them. Andy does a good job of breaking down what he is doing and the camera angles are good. 1) I've found it very helpful to have an understanding of basic music theory going in to it. It's not necessary but it makes it easier to connect the dots. 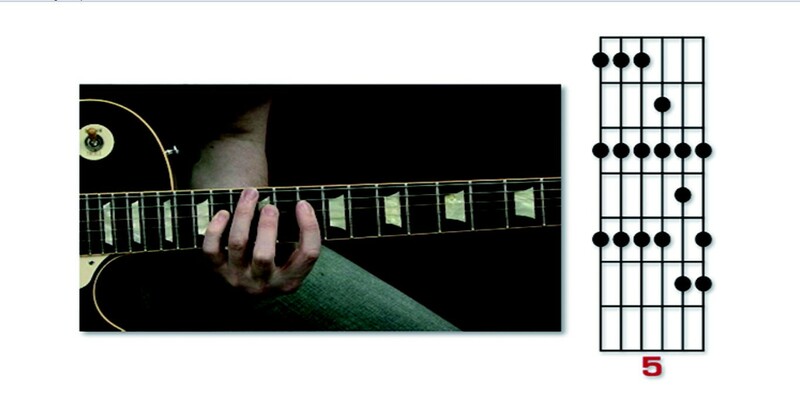 2) The chord diagrams that show the fingerings aren't entirely accurate. They don't show muted strings or open strings. Andy will tell you which are muted and which are open, but if you didn't catch it the first time through you will have to rewind back through the lesson to figure it out. Not a big ding, but it is a minor perpetual annoyance. 3) I was a bit disappointed to find almost the entire 2nd DVD was taken up with the 5 major/minor pentatonic scale shapes. They are necessary but I would have figured an "intermediate" guitarist would have already known these. It just felts like an inordinate amount of time spent on what are "basic" scales. Overall though, I'm satisfied and looking forward to finishing out the rest of the set. Lots of good ideas/techniques for incorporating into your playing! It's been worth the money for me! I found this product perfect as an overview of what can and should be done with lead worship guitar. I have had lots of experience with soft rock and the dvd still added some geat fine tuning in my playing. I've been playing guitar in church for around 16 years, starting from acoustic and picking up electric soon after. I've always been unhappy with my electric playing though as, unless I have to play a specific riff, it always ends up as strummed chords. I bought this course after spending a long time trying to work through the demo lesson on the website and realising just how little I really know! From the very first lesson I've learned new things, even just in how to play simple chords in a different way on electric compared to acoustic. I've been able to take some of the patterns and work them into songs I play in church and generally freshen up my whole approach to electric guitar. I'm thoroughly enjoying working my way through the lessons and would highly recommend this course, particularly to acoustic guitarists transferring to electric or looking to improve their lead guitar skills. 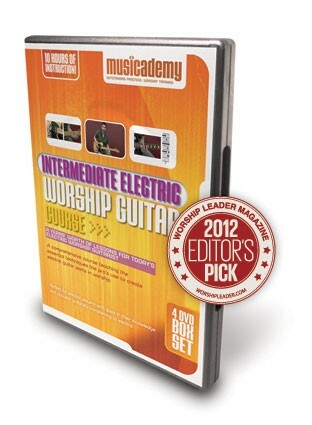 I would recommend this to anyone interested in playing lead in a worship band. It very useful for my worship service. I've been training church guitarists since the early 90's and I am very thankful to have found this resource. We are a mediumish sized Anglican Church in NSW Australia and find it's perfect for a regular small group training session for us. I have five lads come to my house on a Tues night, bring their guitars and Andy has got us arguing over the use of Dropped D, 10th's, multiple locations of pentatonics etc. We would not have had this opportunity before. I think it could only be improved with two minor things: 1. Musicademy throw in a bit more theology, a bit more of the "Why?" and not just the "How? ", but that's a small issue as I can do that myself. 2. Andy could show us a bit more excitement in his playing. Inspire me with some shred dude - I can play boring scales on my own - if you're gonna teach lead, ya gotta go there good and proper so we can follow. Many Thanks Andy and team. Having had little previous experience with using an electric guitar on a worship team, this was definitely the perfect course for me. I had previously used an acoustic guitar in worship settings and when I switched to an electric guitar, I played it the same way as an acoustic guitar. I'm still working through the first DVD but I took time to briefly review the material that lays ahead. The video is of good quality and the lessons are detailed enough for me to understand what needs to be done. I have already incorporated some of the skills I have learned in the worship team that I am now a part of. Learning new voicings for chords I already knew has been very helpful. The backing tracks have been a great practice aide. I could tell after the first week or so that this course was well worth what I paid. I'm looking forward to learning more and more in the months ahead. A big thanks and well done to all those who produced this course!